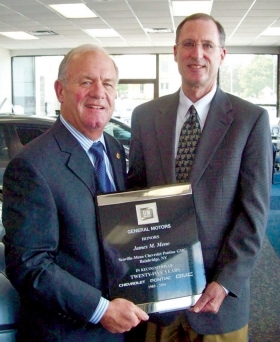 -- Roy Schmidt of Ford Square of Mount Vernon in Mount Vernon, Ill., received a 25-year award for Ford from Ford Motor Co.
-- Barry Williams of Williams Chevrolet in Elkton, Md., received a 25-year award for Chevrolet from General Motors. 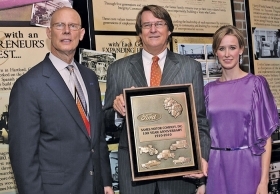 Hank Sames, center, president of Sames Motor Co. in Laredo, Texas, and his daughter, Evelyn Sames Cain, general manager, receive a 100-year award for Ford from Ken Czubay, Ford Motor Co.'s vice president of U.S. marketing, sales and service. 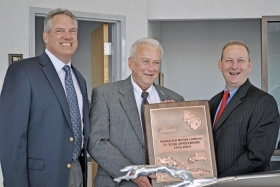 Gary Showalter, center, of Showalter Ford in Vernal, Utah, receives a 75-year award for Ford from James Cook, left, Ford Motor Co.'s market representation manager, and Brian Horn, Ford's Denver regional manager. 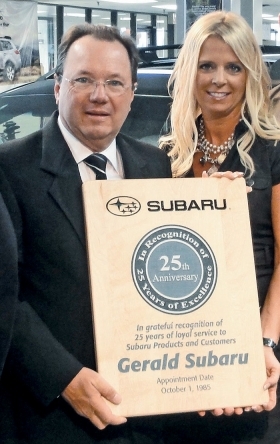 Neil Gerald, left, of Gerald Subaru in Naperville, Ill., received a 25-year award for Subaru. With him is Donna Lawler, the dealership's general manager. Stephen Scoville, left, and James Meno, owners of Scoville-Meno Chevrolet-GMC in Bainbridge, N.Y., received a 25-year award for Chevrolet from General Motors Co.
William Haag and Sheryl Haag of Haag Ford in Lawrenceburg, Ind., receive a 50-year award for Ford. 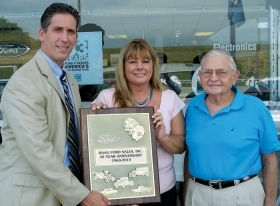 Pictured, from left, are Greg Wood, Ford Motor Co.'s Cincinnati regional manager; owner Sheryl Haag; and former owner William Haag. 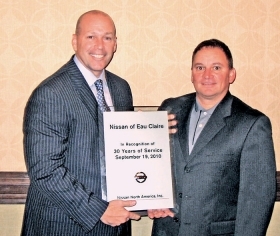 Michael Keil, right, general manager of Lupient Automotive Group's Nissan of Eau Claire in Eau Claire, Wis., receives a 30-year award for Nissan from Paul Minahan, area general manager for Nissan North America's Midwest region.